Posted by SarahAngela on Monday, April 13th, 2015 @ 6:30 pm. 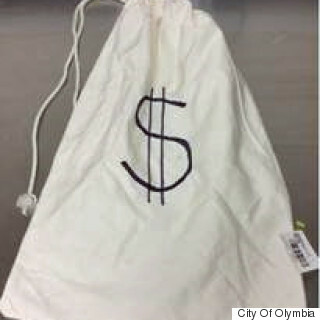 Posted: 04/13/2015 12:02 pm EDT Sometimes, real life imitates cartoons.A Washington state robbery suspect told Subway restaurant employees not to "do anything funny" before he stuffed a sack marked "$" with cash and stolen property, police say. THIS IS FUNNY.David Lingafelter, 22, was arrested Wednesday in Olympia when authorities discovered him hiding behind a dumpster near a grocery store. Lingafelter was on the run after he held up the Subway, authorities said.